Arguably the most compelling thing shown off at Microsoft’s press event yesterday, besides the Surface Book, Windows 10’s new Continuum feature is going to add another degree of utility to our phones. We managed to get a quick hands-on look with the new feature using the new Lumia 950 series smartphones, along with the Microsoft Display Dock that’s required for it to work. The square shaped, almost puck sized optional accessory looks like a generic hub of sorts, seeing that it features two USB 2.0 ports, 1 USB 2.0 high current charging port, HDMI connector, Display Port connector, and a USB-C port to connect either of the two Lumia 950 series smartphones. This hub of sorts, combined with a screen, mouse, and keyboard, turns the Lumia 950 series smartphones to a full-fledged PC of sorts – giving us nearly the same Windows 10 experience we get on tablets, laptops, and desktop PCs. Essentially, the phone is the brains of the operations – while the Microsoft Display Port acts as the nervous system that allows these accessories and peripherals to connect. And that, folks, is what makes Continuum so compelling. The Motorola ATRIX offered something similar a few years back, but Continuum takes it to another level, one that gives us the true power of a real desktop operating system in the palm of our hands. From running the usual Office suite of applications, to surfing the web using the new Edge browser, the experience is identical to something like a tablet running full Windows 10. However, it’s going to be up to developers to really diversify the package, seeing that currently, only “Universal Apps” are compatible to with Continuum. Native apps on the phone, such as the calendar, work fine and scale appropriately, but other third party apps, including some popular touch games, will need to be tweaked in order for them to be compatible. Of course, it’s now a matter of time to see where all of this goes. Right now, however, it seems quite promising for Microsoft. No word yet on the optional dock’s pricing, but it’d be nice to find it somewhere around the sub-$50 range to really have an aggressive approach. Extremely cool. There you can see Microsoft's software competency. If Microsoft keeps improving its product and software line up like this, Google and Apple need to watch out. Maybe not in the next 2 years but in 3 to 5 years from now on, Microsoft can have 20 to 25% of the market if they do things right. Yes, but they need the apps that is the only thing that is keeping me from buying the 950/Xl if they get that sorted get Some developers to port or start making apps i'm all in. They are definitely headed down the right path here. I see this getting WP some good attention and interest.. you'll see a lot of developers jumping aboard to get in on the wave MS is creating. agree, i was watching Microsoft event last night, i was shocked, i feel like i will be getting either surface 4 or surface book. PS or Lightroom and stylus is already something amazing on surface 2 pro, this new one will be off the charts for productivity. 20% to 25% in 3 to 5 years?! That's beyond optimism, dude -- that's delusion. Should have been more like the Surface dock and maybe try and do it more wirelessly. Great idea though. So if you have a Bluetooth mouse and keyboard connected to the phone, and the phone is in phone mode and the app is in desktop mode, where does the mouse cursor go? Stays on perimeter of the phone or just cross past the phone screen and into the app it like it would Cross over to the next monitor with a 3 monitor set up? 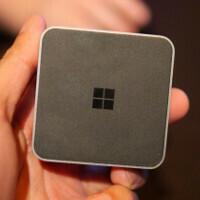 Almost what I was thinking...... Nice idea from microsoft but it would had been fantastic if it was wireless! And even better if you can use the phone it self as a keyboard and trackpad. Reducing items you need for it to work from "a screen, keyboard, mouse, dock and many usb cables" to just a screen. and probably a wireless dock. Actually there is a way to use your phone as a track pad in conjunction with Continuum. When I find the video link on YouTube I'll post it here. Continuum works wirelessly with miracast. This is a game changer for the target customer. Gotta give it to them for being innovative..
Should have been x64, shame on intel they still didn't catch up. It's a shame too. They were on pace to eclipse ARM in mobile ages ago and they certainly have the know how. I wonder what happened. Microsoft would gain MUCH more steam if they offered the docking for free, it would be such good marketing move, but they are a bit stupid. I would like to see how Microsoft Edge works in Continuum. Streaming videos via the Edge browser while I'm on my phone doing other stuff. They only showed Office apps which is nice but they should have also showed a game and the Edge browser. So there's a "PC emulator" in this box?? Nope the phone is pushing all that is needed, hence the need for usb-c. And why 3GB of RAM was needed on an OS that doesn't need more than 512MB to run. USB 2.0? How old fashioned. Wait; I got rid of my usb mouse and keyboard years ago. I've been using wireless. Shouldn't this have bluetooth? Wonder why not USB 3.0 Actually on the video it says 3.0 (0.33 secs) PA error ? This is pretty cool! I feel like if this is priced well it could even be a great set-top box. So you cannot necessarily run any app on your phone using Continuum just those designed to work with it? That is disappointing. Now I understand why startup companies keep trying to run full Linux on a phone. Since this would be my personal not work phone I do net need to run Office applications so it seems that Continuum will be of limited use to me. After comparing the capabilities of Continuum and BlackBerry Blend I think Blend is better. Blend does not require hardware, does not store data in the cloud and can allow you to open files using the software of your choice on the device of your choice.